On this blog I will probably end up prefacing many reviews with this; I'm not really a fan of straight forward thrash. I don't know, I just have a very specific taste in what thrash will do it for me. Hunted Down is from Syracuse, New York. The first thing you'll notice about this demo is the nice piano instrumentation at the beginning. I think the idea here may have been to create the contrast between what is to come after. 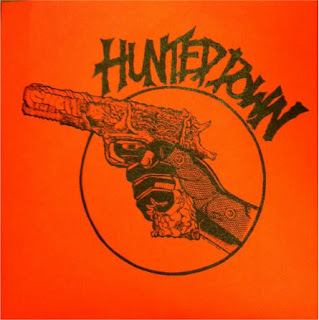 With Hunted Down you get a recording quality that seems to be getting popular among bands like this. It has that ultra fuzz sound on the bass and guitar along with lots of reverb on the drums and vocals. This does make the music sound that much more destructive and "in your face" so I understand why bands do it, but in result, most of the songs end up sounding the same. Still, the music seems very honest, even down to the botched guitar solos and out of tune drum heads (drummer may also be using cracked cymbals here, not sure). The vocals are all out raging. If you like your thrash dirty and disgusting then you'll probably like this.